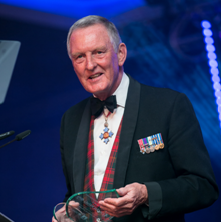 Following the tragic death of Paul Burns, a recipient at the 2013 ‘Soldiering On Awards’, the organizers have announced that the “Lifetime Achievement Award’ next year would be awarded in his name and presented to the winner by Paul’s daughter. On 27 August 1979, Paul Burns’ life changed forever. Travelling through Warren Point in Northern Ireland when the IRA detonated two massive bombs, he was involved in a devastating explosion – eighteen soldiers were killed that day! Paul was one of only two who survived. His story is a remarkable tale of one man’s determination to make the most of his life against the odds. In June 2013, Paul was taking part in the 52-mile Three Counties Bike Ride with friends of the British Limbless Ex-Service Men’s Association (BLESMA) when he collided with a telegraph pole, breaking his femur. He died unexpectedly while recovering from his injury. Read BLESMAs tribute to Paul HERE.